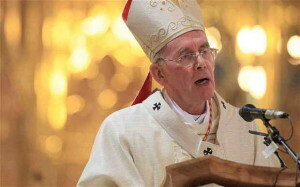 Primate warns "Violence offers no hope for the future." Cardinal Sean Brady has asked the Catholic faithful of Ireland to remember the suffering of Syrian children and their families at Masses this weekend. The Primate of All Ireland also called for fasting and prayers for a speedy end to the “appalling conflict” in Syria and for the delivery of humanitarian aid to those most in need as soon as possible. “The latest devastating images of death and destruction from the conflict in Syria powerfully illustrate the futility of what Pope Francis has described as ‘increasing violence in a war between brothers’,” he said. The Cardinal urged people to remember those who have been made refugees or have been separated from their families by the 29-month old conflict, the death toll of which now stands over 110,000. As many as seven million Syrians are believed to have fled abroad or been forced from their homes since the conflict began in March 2011. The Primate’s comments were made as a meeting of the G20 leaders in St Petersburg ended without agreement on military action on Syria, with the US and Russia still at odds over the need for a UN resolution in response to the chemical attack in Damascus in August. Prayer vigils will be held in a number of church venues in Ireland today in response to Pope Francis’ invitation to the faithful to pray and fast in solidarity with the people of Syria and to highlight the need for a peaceful resolution. The Dominican Community and people in the Black Abbey in Kilkenny will join in union with those gathering in St Peter’s Square by holding an evening of adoration, prayer, fasting and vigil, beginning at 6pm. A vigil Mass will begin at 6.10pm after which a liturgy for peace will be held. The evening will conclude at 11pm coinciding with the close of the vigil in Rome. Separately, up to 2,000 Dublin pilgrims, accompanied by Archbishop Diarmuid Martin, will join in these prayers for peace at a Mass in Lourdes this weekend. Seven planes left Dublin airport at 6am this morning carrying sick pilgrims, doctors, nurses and volunteer helpers for the largest pilgrimage in the country. Nearly 140 secondary school students from 23 different schools around Dublin, along with their teachers are also taking part. Pilgrimage director, Fr Martin Noone, said the 2,000 pilgrims would be bringing their prayers for those affected by the conflict in Syria to the welcoming Mass in St Bernadette’s Church in the French shrine on Saturday evening. “We fervently hope that dialogue, peace and reconciliation will triumph in Syria over scenes of desperation and destruction,” he said.